Park Forest, IL–(ENEWSPF)–June 14, 2010. If you were one of the 200+ Park Foresters that have already purchased a rain barrel, this spring’s rain fall has provided enough ‘free’ water for all your gardening needs. Keep in mind that a 1,000 square foot roof accepts approximately 310 gallons of water in a half-inch rainfall. If the roof has 4 downspouts each accepting roughly the same amount of water, one downspout will accept approximately 75 gallons of water. The Park Forest Environment Commission is selling rain barrels again this year on the first Saturday of the month at the Farmers Market. Rain barrels are available in 55 gallon size for $55.00 and 30 gallon size for $45.00. Rain barrels are available in black, blue, terra cotta, brown and grey. You can pre-order a rain barrel in the color of your choice at the Parks & Recreation department at Village Hall or purchase one directly at the Farmers Market from the available stock on hand. Various accessories for your rain barrel will also be available for sale. 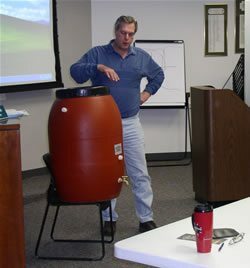 Rain barrels are a great way to conserve water and save money on your water bill by using Mother Nature’s water supply. The Village Board is scheduled to meet on Monday, June 14 at 8 p.m. at Village Hall. Residents are encouraged to attend. The first reading and public hearing on the Village’s 2010/2011 Budget will take place at this Monday’s meeting. Village Board meetings air live on cable access channels (Channel 4 for Comcast subscribers and Channel 99 for AT&T subscribers) as well as on the Village web site at www.villageofparkforest.com. To view previously held Board Meetings, visit the Village’s web site at this link: http://www.villageofparkforest.com and click on the date of the meeting you wish to watch. Housing Authority – Thursday, June 17 at 6:00 p.m.
Monday, June 14 at 10:30 a.m. – Story Lab for children ages 2 – 7. Monday, June 14 at 2:30 p.m. – READ Aloud/READ to Me Time – a great program to help readers. Tuesday, June 15 at 3:30 p.m. – Wii Video Games and Movies for kids. Wednesday, June 16 at 10:30 a.m. – Lap Sit Story Time. Wednesday, June 16 at 11:15 a.m. – Toddler Art – come for the art, stay for the bubbles. Wednesday, June 16 at 2:30 p.m. – Sock Monster Mayhem – a great craft program for kids. Free of charge. Thursday, June 17 at 10:15 a.m. – Discover Time for children ages 3 to 7 – learn about magnets. Thursday, June 17 at 3:30 p.m. – Teen Madness for ages 12 and up. Subject: Altered Books. Friday, June 18 from 3:30 p.m. to 5 p.m. – Kids can enjoy an afternoon of games, puzzles and more. Saturday, June 19 at 2 p.m. – Haunted History – this is a free family program. For additional information, call 708-748-3731 or visit www.pfpl.org. As part of its 25th Anniversary events, the Park Forest Historical Society will hold a special social event, “When Did Your Family Get Here?” on Sunday, June 27 at 2:30 p.m. at Village Hall, 350 Victory Drive. A panel of speakers will share stories of how some families arrived in the Park Forest area, by horse and wagon or by Metra. This will be followed by sharing of stories from some of the audience on how their families came to the Park Forest area. All are invited to share stories over refreshments after the formal program. Anyone who would like to bring photos or documents to share should contact Jerry Shnay, at 708-747-3571 or Jane Nicoll at [email protected]. A fundraiser benefiting the South Suburban Hunger Network will be held on Saturday, July 24 at the Illinois Theatre Center. Tickets are $20 and include light appetizers, desserts, wine, pop and water. The event and musical are family friendly. Tickets are on sale at the Rich Township Food Pantry, 22013 Governors Highway, Richton Park, IL. Body rolling derby on one of the sculpture park hills. Food will be available for purchase at the GSU cafeteria. Water and soft drinks will also be sold in the sculpture park. Golf carts will be on hand for persons who have trouble getting around the sculpture park. For additional information, including times for the musical performances, visit the NMSP website at www.govst.edu/sculpture. The Center for Performing Arts at GSU welcomes Emerald City Theatre of Chicago to present its annual summer theatre musical for kids. The only public performance of “Juke Box Musical Theatre” will be held at The Center on Friday, June 25 at 7 p.m. All seats are $10. For more information, call 708-235-2222 or visit www.govst.edu/center. CAUTION will be playing every Thursday night at Harte’s Saloon, 9858 S. Artesian. If you are a fan of the Grateful Dead, Phish and great musical jams, check out this band. For more information, call Harte’s Saloon at 708-424-2618. The PSC Faculty Jazz Ensemble will perform as part of the Sol-a-Bration Summer Solstice at Governors State University, 1 University Parkway, on Saturday, June 19 at 4 p.m.
On Thursday, June 17 at 10 p.m., radio station 98.7 WFMT will rebroadcast the award winning Marian Catholic High School Symphonic Band’s performance that originally aired on June 12. The band’s performance is part of WFMT’s Introductions program that spotlights the area’s finest young musicians. The program is also available for on-demand listening at www.wfmtintroductions.com. Union Street Gallery is proud to announce its presentation of ‘Not Far Off’ a solo exhibit of recent landscapes in oil by nationally recognized artist Nina Weiss. A reception will be held on Friday, July 9 from 6 p.m. to 9 p.m. For gallery hours or additional information, call 708-754-2601. ‘The Past and The Promise,’ a solo exhibit of black and white photography by regional artist John Spomar II will be shown through July 9. A reception will be held on Friday, July 9 from 6 p.m. to 9.p.m. For gallery hours or additional information, call 708-754-2601. Union Street Gallery will present its 6th Annual ‘A Little Garden Art’ Garden Walk on Saturday, July 10 from 9 a.m. to 3 p.m. Ten beautiful and unique gardens from Chicago Heights, Flossmoor, Frankfort and Olympia Fields are lined up for your pleasurable viewing. A working artist will be present at each garden making art inspired by the gardens and the gardeners. Each garden will also be hosted by volunteers and gardeners who will guide and answer your questions. Come to the Gallery in the morning before you head out for the gardens for some coffee and donuts. You can also view the landscape and garden paintings by nationally recognized artist Nina Weiss. The Gallery will be open at 8:45 a.m. the day of the event. Tickets are $20 in advance and $25 the day of the Garden Walk. For additional information, call 708-754-2601. With the anticipated release of Eclipse, the third installment in the Twilight series, The Holiday Star Theatre is giving Twilight fans the opportunity to not only view the first two movies in the Twilight series, Twilight and New Moon, and a documentary on Forks, Wa. (Twilight in Forks—http://www.popcrunch.com/forks-washington-documentary-twilight-in-forks-on-sale-march-20/), but also several chances to enter a drawing with an amazing prize package. Monday, June 14 at 7 p.m.
Monday, June 21 at 7 p.m.
Saturday, June 26 at 7 p.m. DRAWING: Tuesday, June 29th at 7 p.m. The drawing will take place the day before Eclipse makes it debut, June 29, at The Holiday Star at 7 p.m. and will be broadcast live over the Internet. Fans will only be able to sign up at the theater during one of the Triple-Feature dates listed above. Fans can find out more about the events taking place via the theatre’s website, http://theholidaystartheater.net, on Facebook by friending Holiday Star-Theater and on Twitter via @theholidaystar. As part of our ongoing effort to provide entertainment for each of its members, The Holiday Star will begin showing the first in a series of gay, lesbian, bisexual & transgendered (GLBT) movies next Saturday night, June 19th at 7 p.m. We will feature “Were the World Mine,” a story of gay empowerment, inspired by Shakespeare’s A Midsummer Night’s Dream. Join us on June 19th — costumes are encouraged! Starting this month, the Holiday Star Theater in Park Forest, IL will begin showing a free movie for kids every Tuesday at 9:30 a.m. For details, call the theater at (708) 283-9098. The Holiday Star Theater is located at 340 Main Street, Park Forest, IL. Salon Artist’s Gallery has extended its Father’s Day Art Sale. Store Hours are Tuesday, Wednesday, & Friday, June 15, 16, and 18 from 10 a.m. to 4 p.m.. Don’t miss out on your chance to save. 20% to 50% off specially marked items. For additional information call 708-833-5108 or 708-748-3946. Fresh, locally grown fruits and vegetables are coming to GSU at its first-ever outdoor farmers market on Thursday, June 17 at the south end of Parking Lot D. Hours are 1 p.m. to 6 p.m., rain or shine. The Farmers Market will be held on Thursdays through September. On Wednesday, June 16 from 7:30 a.m. to 8:30 a.m., those ages 11 – adult can enjoy light exercise as you meander through Thorn Creek Woods. Experience the arrival of spring first-hand as you walk the 1.5 mile loop with a naturalist. Trails can be wet or muddy so please wear sturdy shoes. Terrain is moderate. The Walkers will meet each Wednesday through June 16 and there is a fee of $2 per week. For more information, call 708-747-6320. The Rainbow Café is an opportunity for single or partnered gays, lesbians, bisexuals or other sexual minorities, and their allies, over age 18 to meet one another and socialize in a safe and supportive atmosphere. Those attending are encouraged to bring some non-alcoholic drinks and a dessert or snack to pass, or bring a financial donation. However, neither is mandatory. The Rainbow Café is held from 7 p.m. to 9:30 p.m. on the 3rd Saturday of each month at the Unitarian-Universalist Community Church, 70 Sycamore Dr. For more information, call 708-481-5539 and connect to the Rainbow extension. Lansing – Friday, June 18 – U.S. Cellular Store, 16925 Torrence Ave. from 1 p.m. to 7 p.m. Throughout the rest of 2010, the traveling tour will make stops at festivals, fairs, concerts and U.S. Cellular retail stores. The event schedule and latest tournament rankings will be updated every Wednesday and Friday at www.uscellular.com/speedtext and the score to beat will be available at every stop. On Thursday, June 17 from 8:30 – 10:30 a.m., the Connect Café is a place for the community to hang out, have a cup of coffee, latte, or hot chocolate, listen to music, talk, play a game of chess, or just relax. Kid friendly, also for Mom’s and Dad’s. This event will be held every Thursday. For more information, call 708-748-1995. Sources: Park Forest 2010 Summer Recreation Programs & More; Park Forest Winter/Spring 2010 Recreation Programs & More, Village of Park Forest, Governors State University, Prairie State College, Marian Catholic High School, Tall Grass Arts Association, Union Street Gallery, Park Forest Rotary Club, South Suburban Family Shelter, Park Forest Historical Society, CAUTION, and Holiday Star Theater websites.